I can't believe it's been nearly three weeks since I last posted. Work has been particularly demanding lately and I've missed my little blog. Although not vintage, the print looked as though it had been designed in the 60s (unlike a lot of so-called retro clothing out there). I decided to find out more. 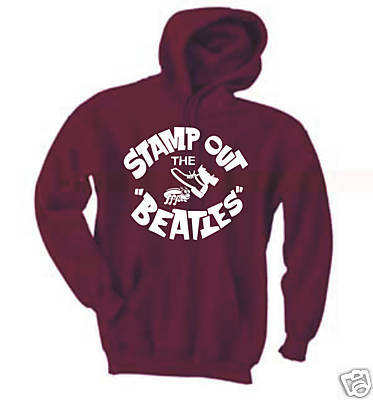 Q: "I must tell you, by the way, that Detroit University have got a 'Stamp Out The Beatles' movement." JOHN: "Yeah, we heard something about that." PAUL: "We've got a 'Stamp Out Detroit!'" Q: "They think your haircuts are un-American." JOHN: "Well, it was very observant of them because we aren't American, actually." 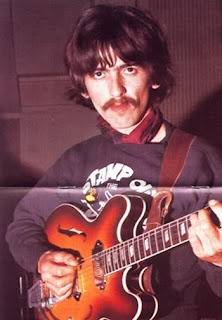 The 'movement' was also referred to in the press conference given at Kennedy International Airport after the Beatles had touched down in America for the first time (You can read a transcript of the interview at BeatlesInterviews.org). 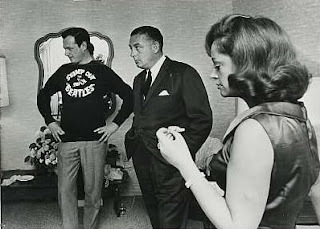 George Harrison and Beatles manager Brian Epstein were photographed wearing a sweatshirt (possibly the same one) with a 'Stamp Out the Beatles' print. Epstein was apparently very reluctant to put it on but was eventually persuaded. There seems to be a lot of misinformation about this campaign and I've had trouble finding any definitive explanation but according to a knowledgeable person on this forum, this sweatshirt wasn't actually made by the 'movement' but rather made to SPOOF it. You can get one of your own here. Thank god it didn't succeed! Can't imagine today without them! Welcome back! the 60's brought out some mighty weird things but at least...this 'stamp out' stuff was stamped out!